To quote Roberta Smith: Happy Birthday, Abstract Art! “On Display” was selected as the “Best in Painting” Critics’ Pick this week in Time Out NewYork. Whether you’re an artist, critic, art blogger, collector, art historian, art fan or gallery owner, the term “abstract” is loaded with many associations and we plan to unpack some of its meanings at a special discussion/birthday party for abstract art on Sunday, August 22, 4-6 pm at Storefront Gallery (16 Wilson Avenue, Bushwick, Brooklyn). One of the preeminent aesthetic accomplishments of the modern era, abstract art may be ubiquitous nowadays but that wasn’t always the case. 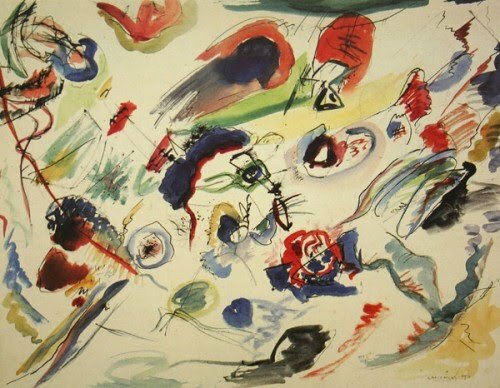 Join us for a frank discussion about how far we’ve come since Wassily Kandinsky, Piet Mondrian and Franciska Kupka’s early abstract art experiments and whether the term is even useful anymore. We want to hear your thoughts and we’d love for you to join us for some birthday cake, coffee, and stimulating (if abstract) discussion about the state of abstract art and abstraction in 2010. Is there any way that we out here, a long way from NYC, might hear, read, view some of that discussion on Abstract Art? Will it be YouTubed? Previous Previous post: Casting call for second season of "Work of Art"